My sons' headteacher at their independent special(ist) school, once said to me that inclusion was about being included in society as an adult, not squashed in a one-size-fits-all classroom. And, while the government says is dedicated to children being educated in mainstream schools, the fact is our education system just isn't set up to cope with children with a vast range of different needs all being in the same setting and benefiting equally at the same time. The government seems to have high-minded/handed ideals, without looking at the reality of what is available, given the current structure, facilities and staff training. The move to spend money resurrecting grammar schools is a step even further away from what inclusion really means. 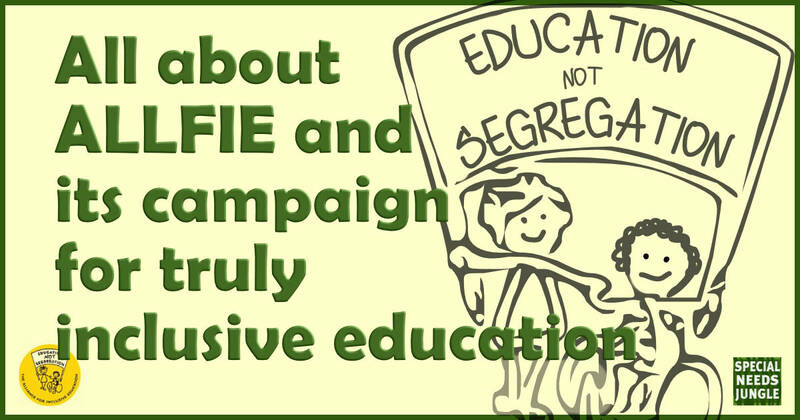 ALLFIE, the Alliance for Inclusive Education, is a campaigning organisation led by disabled people aimed at creating true inclusive schooling, by completely changing the current system. Simone Apsis, ALLFIE's Policy and Campaigns Coordinator has written for us explaining what this means for them. As ever, your views are welcome on the blog's comments at the end of this post as Simone may not see them if you just leave them on Facebook. The Alliance for Inclusive Education is an organisation that promotes and campaigns for disabled pupils’ and students’ human and civil rights to inclusive education. Whilst we are led by disabled people, our membership and support also comes from our allies, parents, SEND professionals and schools, colleges and universities. We believe that, first and foremost parents want their disabled children to feel part of their family and their local community. We believe that disabled children can only enjoy a truly inclusive childhood if they play, learn and build friendships with their peer group, including non-disabled children. It’s not only disabled children who benefit, but also non-disabled children and the community as a whole, as this inclusivity helps everyone to grow up understanding and valuing each other, and to carry this into adult and community life. When we talk about inclusive education, we are talking about fundamental changes to how our education system operates. Inclusion doesn’t just mean getting disabled pupils and students with SEN through the doors of a mainstream school, college or university, and only providing an accessible building and specialist equipment. It means reviewing the structures and values within the education system which make real and fully inclusion difficult. All too often, what children, young people and parents experience in mainstream education is limited ‘integration’ where disabled pupils and students with SEN are expected to fit into an education system that does not take into account their abilities, learning styles and ways of being in the world. We want a move away from ‘integration’ to fully-inclusive mainstream education provision and practice, where disabled people of all ages and/or those with SEN can be educated in mainstream settings alongside their non-disabled peers. We want to see a commitment to removing all barriers to the full participation of everyone as equally valued and unique individuals, both within the classroom and the wider social and cultural life of the school or college. During our 25 year history ALLFIE has worked effectively with parents and allies, as we believe inclusive education can only be achieved with everyone on board and committed to making it happen for ALL pupils and students. Over the past decade our remit has widened to cover all forms of mainstream education - schools, colleges, training, universities and apprenticeships. Despite the many challenges we have faced from successive governments that have been busy undermining education providers’ best efforts to develop truly inclusive education practice, we have managed to secure some major achievements. ALLFIE campaigned successfully for the human rights of disabled people to be supported in mainstream education, which is now enshrined in Article 24 of the UN Convention on the Rights of Persons with Disabilities (UNCRPD). The Labour government ratified the UNCRPD in 2009 and since then we have campaigned for full implementation of Article 24 in all legislation, policies and practices. Subsequently ALLFIE managed to secure strong guidance that sets out the UN Disability Committee’s expectation that Governments should develop an inclusive education system that welcomes and properly supports all pupils regardless of ability. Like many of the parents on your website, ALLFIE wants to ensure that gaining access to mainstream education for a disabled child or young person is no longer such a struggle. We also campaigned successfully for the retention of the “presumption of mainstream education” in the Special Educational Needs Act of 2001, and also in the Children and Families Act 2014 which replaced it, despite the Government’s initial intention to remove the provision in relation to school–based education. .
ALLFIE’s Manifesto for Inclusive Education consists of six simple and do-able demands covering changes to law that would give disabled pupils and students rights in mainstream education, changes to the curriculum and qualifications which would allow for real flexibility in terms of how learning is tested, all within fully accessible premises with support that is based on what the young person needs rather than what the education provider or LA is willing to provide. ALLFIE’s Case for Inclusive Education booklet is central to our current campaign work, which includes challenging the Government’s ‘raising standards’ rhetoric which has in reality led to increased selective education, academic targets, reducing resources to encourage education providers to develop great inclusive education practice whilst weakening the legal protections that disabled pupils and students have in accessing mainstream education. The Government appears to be determined to flout its obligations as set out in the UNCRPD and the ‘presumption of mainstream education’ enshrined in UK law. ALLFIE is now actively campaigning against the Government’s proposals to increase state funded selective education outlined in the “Schools That Work For Everyone” Green paper. See our Education Not Segregation campaign for more details. ALLFIE has been at its best when campaigning alongside other people, groups and organisations who share our vision of real and lasting inclusion. We know that it takes communities to work and campaign together to secure great inclusive education systems, so we are developing new opportunities to work with disabled children, young people and their families, in partnership with their local organisations led by disabled people. ALLFIE’s Inclusion Champions’ work will bring together families and disabled pupils and students with disabled people’s organisations, working together with schools and colleges to develop and share good practice of inclusive education and great local person centred services. The SNJ post displays with 1122 more words to view by clicking on ‘more’….but the first few words say enough. They strike at the heart of a fundamental flaw in our education system. Despite all the hype, it’s exclusive. And that’s before grammar schools increase. The mainstream premise is such a fundamental root of sooo much SEND heartache… those whose needs ‘can’t be met’ have to endure or escape. Here, in Herts, there is no halfway house. No compromise. No individual response. Cost efficiencies coupled with the personal values of Ed leaders neccessitate that one size does not fit all here. Here in Herts, if you cant fit in, your out; Mainstream (MS) or special. Nietherway, included. And once you’re out, even the local community clubs, aligned to MS schools, are no longer accessible. Further exclusion. I said ‘she IS different’! So are my other two children. There are 30 individual children in the average classroom and all, from time to time, will benefit from individual learning arrangements. These may not appear efficient, but deliver the best outcomes I presume. Why else would schools do this? That’s the point of nurture groups and personalised SEN Support planning. Unique responses to individual difficulties, that should work. And if they don’t, we graduate up the levels of further intervention. The fact that our Herts special schools are bulging makes it plain for all to see that schools here at least, can’t meet the LA/Gov MS ideal…it’s mainstream schools arent equipped and resourced to deliver this graduated response. The interventions fall short of being as individual as ALL of it’s children need (but we still haven’t tried bases) …and so these children are nudged along….persuaded the ‘other’ school will better meet their needs. Clear in the knowledge that the struggling school is right…off we trot to find inclusion in a special school! I love my daughters very special school, it was three right choice …of the choice we had. MS school at the bottom of the guarden v special in another town. It’s shows what can be done. But largely due to a refusal to have bases attached to MS schools in Herts, she is now thoroughly removed from her peer community at home. And lonely. It strikes me that here in Herts, there is a refusal to go the whole mile for ALL the children. Personalisation of MS learning is for the majority not the few and their is confusion between inclusion in everything to be included at all. Sometimes, a half way house is needed. ‘The base’. Some inclusion, individually planned, is I think better than non. Parallel teaching, for some children with SEN, is a compromise. Compromise is not surrender, its a working out. Its inclusive of all. I wish ito had been an option for my one child, removed from friends, town and siblings at age 9 for convenience. The Gov driver for SEND Reform is outcomes. That’s economic outcomes, not just my child’s outcomes! Section A of our EHCP is titled ‘All about Me’ but it’s not about my child. It sounds nice. But the whole EHCP, for a small group of the most needy pupils, has as much to do with planning for her to fit the pre-determined system. The system which enables the able to choose wherw and if to travel, or not. While the more disabled are nudged out of their comminity, forced to travel far further despite their difficulties, because mainstream can’t achieve a fundamental teaching premise, that there are 100-2000 individuals in a school and they must all be taught individually. Off to finish our EHCP to maintain our precious special school place. We need dedicated autism schools. Society’s attitudes need to change. Mainstream is not set up for such a wide range of different learning needs and never will be. Most autistic children find mainstream too difficult and the negative impact on them too great. The government says all children have a right to inclusion, that isn’t the same as saying it’s right for them. Teachers simply cannot be a jack of all trades, these children deserve better and speaking for autism, it is such a unique condition that it needs a tailored approach that will not be possible in a mainstream. Yes I completely agree some children cannot have their needs met even in a special school and this can lead to all sorts of catastrophic after effects when they come home from school after holding it in all day. It is hard enough to get your child who is in the wrong setting accommodated and/or in a residential school as it is. LAs fight vigourously any attempt to make them do their statutory duties towards severely disabled children. For whom? It may be that your son is appearing to do OK because they are very nurturing. But that doesn’t mean his next school will be, or that automatically he is managing as well as it appears right now. As for your daughter, as a female especially she may learn to mask. But being in a mainstream environment, however great that makes her at masking and ‘passing’, will do no favours for her mental health or internal experience. High-functioning autistic children’s brains also work differently than yours. Don’t be fooled by exterior appearances with your children. Find out what they really want and need from them.